^ 1.0 1.1 PGC 69533. SIMBAD. 斯特拉斯堡天文資料中心. ^ 2.0 2.1 2.2 2.3 2.4 2.5 2.6 2.7 NED results for object PGC 069533. NASA/IPAC Extragalactic Database. [May 17, 2017]. ^ 3.0 3.1 The Milky Way's (almost) identical twin. Phil Platt. [May 17, 2017]. ^ Supernova 2004ef in UGC 12158. David Bishop. [December 14, 2016]. ^ 5.0 5.1 T., Boles; M., Armstrong. Supernova 2004ef in UGC 12158. IAU Circular. 2004, 8403. Bibcode:2004IAUC.8403....2F. 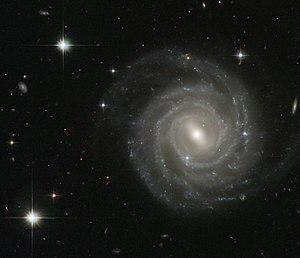 ^ G., Folatelli; 等. Supernova 2004ef in UGC 12158. IAU Circular. 2004, 8399. Bibcode:2004IAUC.8399....2B.